U R Ananthamurthy’s speech for you! The stalwart is no more, but his write ups remain – read and enjoy! U R Ananthamurthy talks about how he realised his love for language and his decades as a writer. While many courts have deemed that Ganesha idols made of Plaster of Paris cannot be banned, civic and pollution monitoring bodies say the onus of making the celebrations eco-friendly lies with people. How will you choose to celebrate? How nice Ulsoor lake looks when you are dangling in the air! 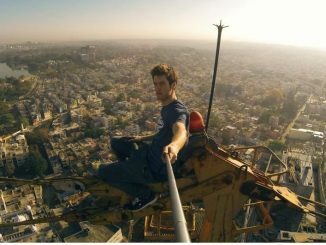 British stuntman James Kingston recently visited Bengaluru, only to dangle several hundred feet above the ground from a crane. And what did he see? A spectacular view of Ulsoor Lake! 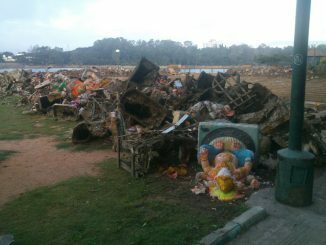 Distraught at the manner in which Ganesh Chaturthi is being celebrated nowadays, a citizen offers suggestions to make changes that will have a positive impact. There are other states that have tried to ban plaster of paris Ganesha idols but the court has ruled the ban as illegal. So the onus of making the celebrations eco-friendly lies on people, say officials. Many special KSRTC buses from across Bangalore, with advance booking facility, will help you out! Travel with four people and get 5% discount on the fare, get 10% discount for booking return ticket! Want to deal with climate change? This is for you! A workshop to empower youngsters to implement creative ideas to mitigate and adapt to climate change. When a road in the centre of the city became too much for the city to handle by itself, what did some sensible residents do? They just pitched in with their own money and plan, and the road was transformed. “We should not be politically correct – then we are NOT correct” — the quote more or less sums up a literary colossus who was never afraid to speak his mind. A background into the life of the stalwart, U R Ananthamurthy. Septic tank waste that is supposed to be carried to a farm near Kanakapura Road is allegedly being dumped near Ulsoor lake, in front of a school, posing a health threat to students and residents.